2. It looks like a big cat. 3. It lives in deep, dense forest. 4. There are many kinds of tiger. 5. It lives on the flesh of other animals. 6. It hunts in the night and sleeps by day. 7. Some tigers eats human flesh is called man-eater. 8. It is a very strong animal. 9. It is our national animal. 10. We should preserve this species. The tiger is a dreadful animal. It looks like a big cat. It has a round head, huge body and a long tail. 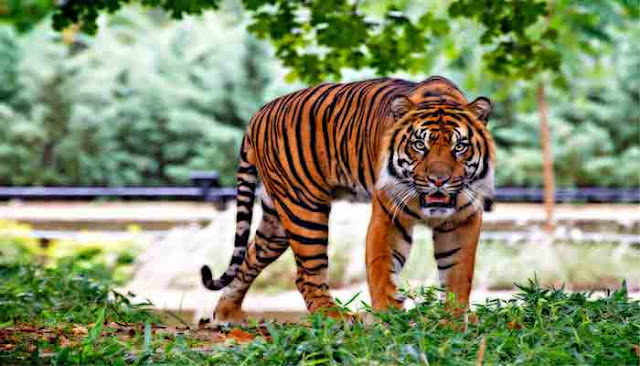 The Royal Bengal tiger has black stripes on its body. The leopard’s skin is spotted. It lives in a thick forest. It is a beast of prey. It kills sheep, goats, cows , deer and men. A man eater is always very dangerous. We find tigers in the zoo and in the circus. It is the strongest and the bravest of all animal. Tiger hunting is a dangerous game. Tigers are fast dying out from our jungles. So, the Government are now trying to preserve them.